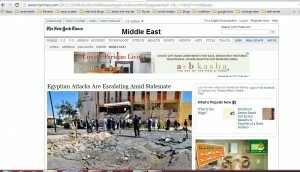 Blog Why New York Times Correspondent In Cairo Is Faking News About Egypt? Why New York Times Correspondent In Cairo Is Faking News About Egypt? 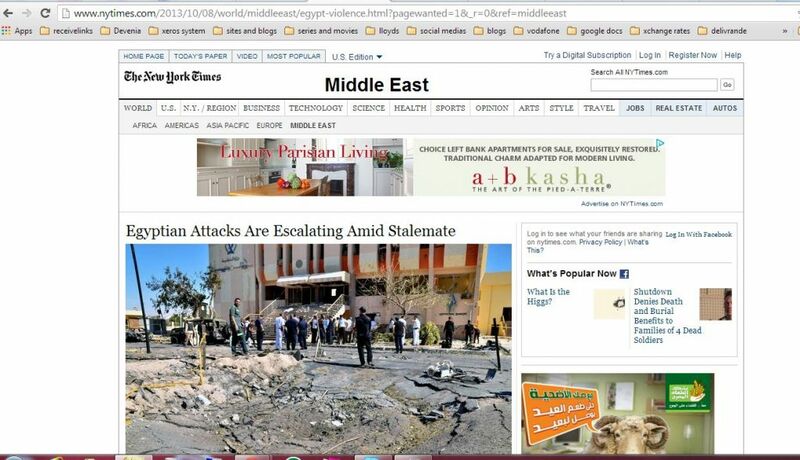 On 7/10/2013, New York Times published an article “Egyptian Attacks Are Escalating Amid Stalemate“. That article was about the violence which took place in Egypt on 6/10/2013. Written by New York Times correspondent, DAVID D. KIRKPATRICK & Mayy El Sheikh contributed reporting. The Correspondent of New York Times, published that article on 7/10/2013, the next day, violence took place, and before the concerned authorities or the Autopsy Doctors finish their reports which are not released yet, and also investigations still going on! Based on what the New York Times correspondent mentioned, the correspondent must have attended personally, the violence acts which took place in 4 different cities at the same time which are Cairo, Giza, Menia and Beni -Suef cities, and he also must have seen with his own eyes the Egyptian Security Forces killing those 53 Protesters. In that case, I think Mr. David D. Kirkpatrick should immediately go to the Egyptian investigators and provide his definite evidences and put his testimony, so justice will take place. For some reasons, the New York Times, did not provide any evidences showing security police killing those 53 protesters like they claimed! But even if they do and in order for someone like me to believe what they have published, I have the right to ask a very important question here: How did the correspondent of the New York Times, verified in case that what he claimed is right, that the killers were from the security forces? Specially that there are many individuals arrested in different cities in Egypt, wearing Military and Police uniforms and caught committing violence acts and carrying weapons shooting civilians! Was the Correspondent aware of that fact, and did he check before publishing his article, any of those cases?! On the other hand, The New York Times published that article on 7/10/2013, while the Egyptian Health Ministry’s Autopsy Doctors, were still working on bodies autopsy and haven’t published till this minute we speak, the final reports details in relation to those bodies. Not only this, but the investigations held by the Concerned Authorities are still going on and haven’t published any confirmed details yet about accusing directly people by names of killing those 53 protesters! Oops! But the New York Times accused the Egyptian Security forces based on the article of their Correspondent, not only direct accusations, but also New York Times obviously held an urgent court case in their News Agency Residence for the killers and condemned them of killing!!! Can they provide us with the security forces full names and Ranks?! Only on 8/10/2013, the Autopsy Doctors announced and confirmed the numbers of 53 death and 271 injured in 4 cities and the death cause was shots by live ammunition and shot guns. But the Correspondent of New York Times published on 7/10/2013, that the majority of the 53 bodies got shot in the head and chest! From where the correspondent got that fact of shots in the head and chest, unless he personally attended the autopsy and examined all the 53 bodies with the Autopsy Doctors! Does Mr. David work as New York Correspondent or an Appointed Autopsy Doctor in Cairo?! The correspondent wrote in that article that the protesters who got killed are Brotherhood supporters! Again, how did he realize that? Specially that on 8/10/2013, the concerned Authorities Investigators and the Ministry of Health announced that they have some non-identified bodies and till this minute, Both Authorities have n’t published any reports about whether those who got killed are all Brotherhood supporters or Anti Brotherhood or from Both sides or whoever killed them! The Correspondent mentioned in the 1st and the 2nd page of his article that the Brotherhood students are demonstrating in schools and universities and made interviews with Brotherhood supporters and claimed that the Egyptian Authorities are oppressing and committing violence against peaceful Islamist protesters and arresting them and putting them in jails! He also made the Brotherhood demonstrations sound and seem like they are peaceful and they are victims of the Egyptian Authorities! Did Mr. correspondent of New York Times, see all those accusations and serious crimes with his own eyes? Has he ever been to any University or school in Egypt and got evidence that the Brotherhood supporters are victims of whoever and they were not at anytime committing violence against other students who attend schools and universities to learn and not not commit violence? And does the correspondent know that for any foreign correspondents to enter any schools or universities in Egypt, you must get an authorized permit from the concerned authorities in Egypt? So, if he did see with his own eyes peaceful demonstrations of Brotherhood supporters in schools and universities, how did he enter those schools and universities?! 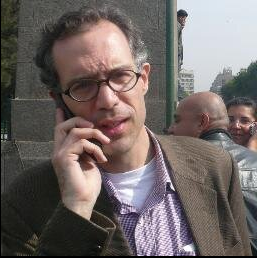 Has Mr. DAVID D. KIRKPATRICK, the correspondent of New York Times in Cairo ever seen or attended the arrest of any Brotherhood supporter or even leaders, who were put in jail for a faked crime by the Egyptian Authorities? Is he a Lawyer too? beside being a correspondent and autopsy doctor?!!! Is that how Foreign News Agencies work? How did the correspondent of the New York Times, verified that the Brotherhood supporters are demonstrating peacefully in schools and Universities? And how did he come up with the conclusion that they are oppressed and put in jails by the Egyptian Authorities? And how did he prove that what Brotherhood supporters are committing, is nothing but being peaceful in their protests! New York Times Accused, judged and condemned Egyptian Security forces of killing 53 protesters and Egyptian Authorities of locking Brotherhood leaders and protestors in Jails and oppressing Peaceful demonstrators, and those are very Serious Accusations. As an Egyptian Citizen, I’m telling the New York Times and their Correspondent DAVID D. KIRKPATRICK & Mayy El Sheikh contributed reporting in that article of theirs, to provide evidence and go and put their official testimonies in the General Attorney Office, Otherwise, New York Times is faking news about my country, publishing lies, accusing our Military, Police forces and Egyptian Authorities of fake accusations and in this case New York Times is violating the Media code of conduct, and the Egyptian Government beside the Security forces and all the concerned authorities who were directly accused by New York Times with such serious crimes, have the right to raise a Law Suit against New York Times and this last, takes the consequences of publishing and spreading fake news. If you call the people who use weapons, knives, swords, Molotov and even stones are “peaceful demonstrations”, and If that’s the definition of New York Times for “Peaceful Demonstrations” , please tell me what is Violence then and please define the word “Violence” for a retarded third World country citizen like my self!!!!!! The Brotherhood supporters are not neither demonstrators nor peaceful! Obviously the Correspondent of New York Times is making interviews with some individuals sitting in an Air Conditioned comfortable safe closed rooms, instead of attending the real action violence which is taking place on the real ground!